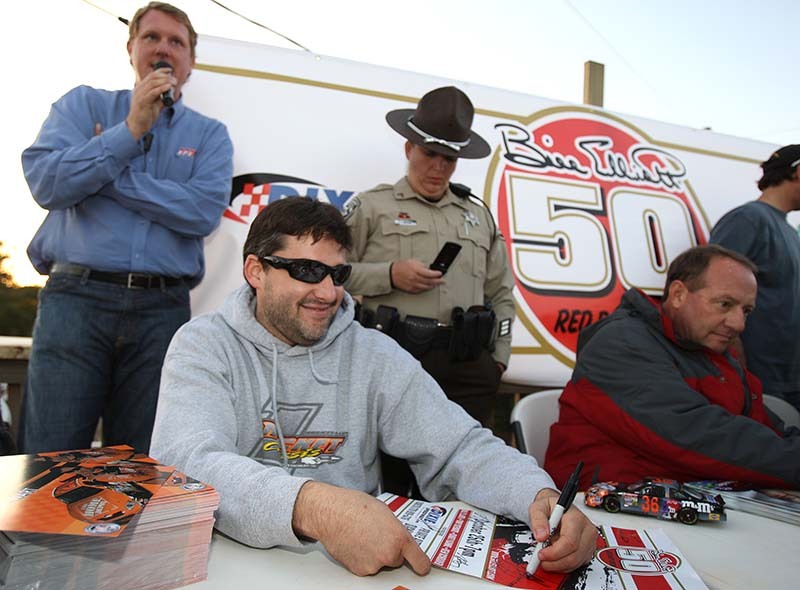 In late October 2008, race fans attending one of Georgia’s most storied dirt tracks enjoyed a special evening of racing featuring not only local stars, but also several celebrity stars of NASCAR’s premier Cup circuit. 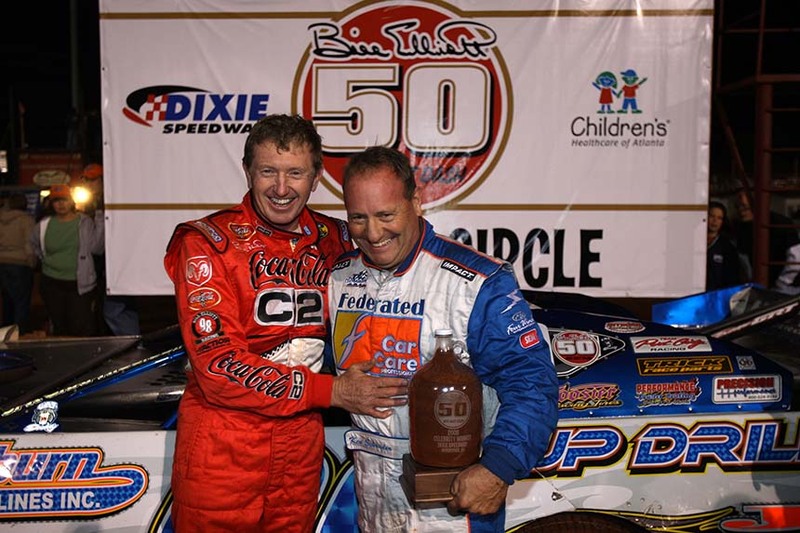 The one and only Bill Elliott 50 Red Dirt Dash event at Dixie Speedway in Woodstock, GA. is still considered one of the track’s finest nights of racing. As a Georgia native, Elliott began his racing career at Dixie Speedway as a teenager, driving cars that he and his father, George Elliott, built in their home garage in Dawsonville, Ga. In fact, the younger Elliott scored his first race at the track on Sept. 7, 1974 at the age of 18. Thirty-four years later, Elliott returned to race in the 50-lap super late model event. Elliott invited several of his friends from NASCAR’s premier Cup series to participate in the special celebrity event to benefit Children’s Healthcare of Atlanta for cancer research and treatment through gate ticket sales and a special autograph session featuring Elliott and his fellow Cup series drivers. Dave Blaney qualified fastest of the seven NASCAR celebrities, followed by Tony Stewart, Ken Schrader, David Gilliland, Bill Elliott, Kasey Kahne, and Ray Evernham. 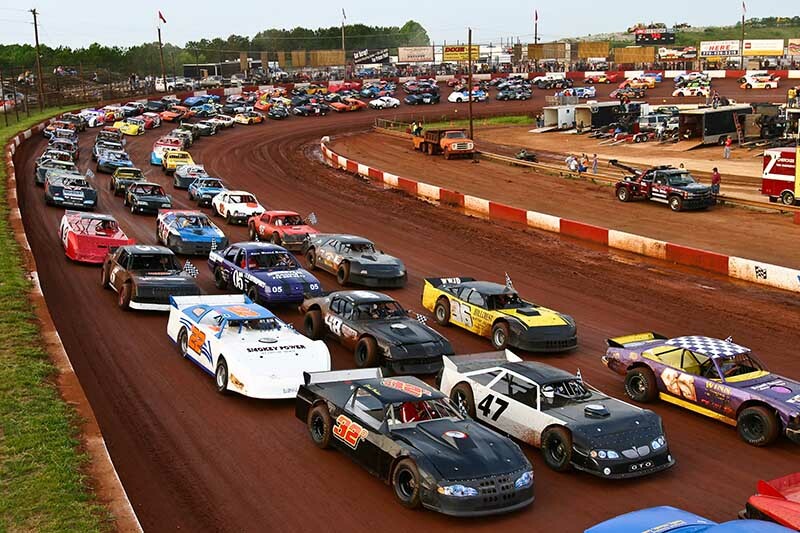 The near capacity crowd enjoyed a 25-lap super late model celebrity race featuring a two-stage format that included an inverted field for the final 15-laps. At the start of the first segment, Blaney was quickly passed by Stewart, another legendary dirt track racer. The Rushville, Indiana native went on to win the segment by a comfortable margin. Schrader started the final 15-lap segment up front and enjoyed the view from the front of the field. An excited crowd watched as Stewart and Blaney came from the rear with their sights on Schrader, but as hard as they tried, did not have enough laps remaining to take the win away. They finished second and third, respectively. Gilliland finished fourth, followed by Kahne, Elliott, and Evernham completing the final four spots. Those in the grandstands were also treated to some exciting racing in the main event. Driver Chris Madden of Gaffney, S.C. took the lead at the green flag and held the point for 20 laps before being passed during a late-race restart by Shane Clanton of Locust Grove, Ga. Clanton pulled away and was never challenged for remainder of race. Chattanooga’s Dale McDowell finished second, followed by Madden in third, Clint Smith fourth and Ray Cook fifth. Even today, Schrader feels comfortable on dirt, having raced on them for over 40 years.